Stannis will fake his own death. He will use this to his advantage by attempting to lure Bolton allies from Winterfell, rendering the castle ripe for the taking. In Volume III, I further elaborated a method by which Stannis might draw the Bolton army from Winterfell, by taking the Dreadfort. A possible concern remains in the fact that the Dustin and Ryswell forces might remain at Winterfell even if Bolton departs for the Dreadfort. In this case, it would benefit Stannis greatly if he had a method by which to remove these two houses from the situation, particularly since they are bound to Bolton by marriage and unlikely to change allegiances. Stannis has a secret force which will set Barrowton on fire, drawing the Ryswells, Dustins and possibly the Flints from Winterfell. Unknown Allies. The secret allies that Bolton does not know about. Goodbye Horses. How the supposedly dead Stannis plans to draw Bolton’s staunchest allies from Winterfell. Earlier in the Mannifesto I argued that Stannis knew or deeply suspected Arnolf Karstark of treachery, and showed evidence to that effect. Karstark does not seem to have a full picture of Stannis’s proceedings. We have to wonder why this is, and to what purpose these omissions are intended. Can you see the significant difference in revealed Stannis co-conspirators? Mors Umber and the Mormonts are not mentioned by Roose. They appear to be factions that he is completely unaware of. I’ll grant you that Mors is later revealed to Roose Bolton as an ally to Stannis (THE PRINCE OF WINTERFELL – ADWD). However Roose never seems to learn that the Mormonts have seemingly backed Stannis Baratheon. This detail is never revealed to Roose Bolton in A Dance with Dragons. Isn’t it conspicuous that Bolton is not aware of the Mormonts? It would be easy to dismiss this if it wasn’t for the fact that the omission of Mors was quite important to the ‘Arya rescue’ plot. Wouldn’t that by nature suggest that the Mormonts might be put to some sort of use as well? 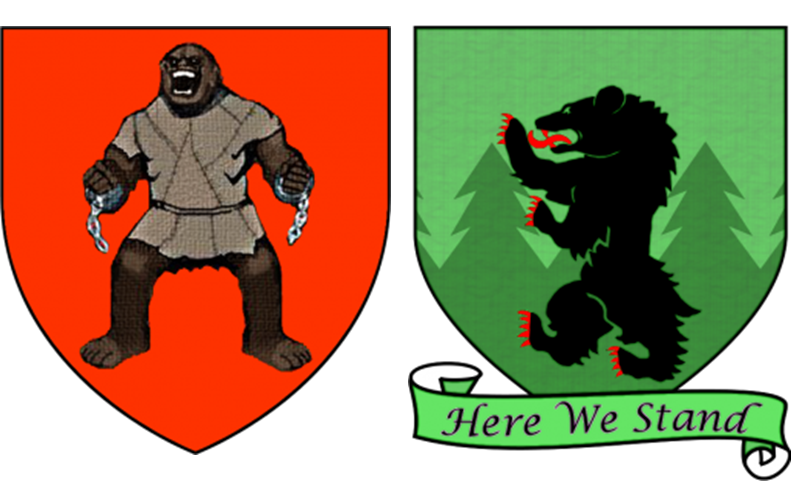 Firstly, what kind of Mormont force are we talking about? Would Stannis leave idle a ‘gaggle’ of fighters that might otherwise be put to use? According to Stannis’s letter to Jon, Alysane Mormont was joined by a ‘gaggle’ of fighters. A ‘gaggle of fighters’ does not sound like a large force, but rather a small band of veteran warriors. A Dance with Dragons does not specify what became of Alysane’s men after the battle at Deepwood Motte. However, as far as the text is concerned, Alysane Mormont is the only person from Bear Island to have joined Stannis on his march. This is almost certainly the case, as we never see her administrating her men nor any mention of other Bear Islanders during Stannis’s trek. Upon finding men willing to aid his cause or fight for a shared interest, Stannis is not the sort of man to ignore the opportunity to use them as effectively as possible. It is inconsistent with Stannis’s sense for the pragmatic. It also makes little sense that Alysane Mormont would commit to joining Stannis and yet offer up no aid besides her own self: Stannis does not need one additional sword, he needs a strategic advantage. So how can Stannis cultivate a strategic advantage using the Mormonts? Simple, Stannis benefits strategically if he can repurpose their observed capacity for ‘false flag’ guerilla naval tactics. She wondered who was in command of her foes. If it were me, I would take the strand and put our longships to the torch before attacking Deepwood. The wolves would not find that easy, though, not without longships of their own. Asha never beached more than half her ships. The other half stood safely off to sea, with orders to raise sail and make for Sea Dragon Point if the northmen took the strand. [From Jon’s letter from Stannis]: Greyjoy’s longships are burned or taken, her crews slain or surrendered. So Alysane and a ‘gaggle of fighters’ aided Stannis. And they captured Greyjoy longships. So how many Greyjoy longships did Stannis acquire? He had set sail from the Shields with ninety-three, of the hundred that had once made up the Iron Fleet, a fleet belonging not to a single lord but to the Seastone Chair itself, captained and crewed by men from all the islands. Her lord father had given her thirty longships to capture Deepwood. Four remained, counting her own Black Wind, and one of those belonged to Tris Botley, who had joined her when all her other men were fleeing. Asha never beached more than half her ships. Which ships were set on fire, and by whom? Stannis and his northmen attacked Deepwood Motte under the cover of darkness, without any sort of light to betray their approach. Thus it would seem entirely likely that they did not have torches with which to burn ships. Further, it seems reasonable to believe that the beached ships were minimally staffed or even completely unoccupied. When you consider that the ironborn fleeing Deepwood were defeated before they reached the shore, it seems like these boats would be easy to capture. By comparison, the longships that Asha left at sea would not be so easily taken. They would have been completely manned, and given their design would likely be able to outrun any pursuing fishing boats. Also, the ironborn are talented warriors in general and in particular are quite familiar with fighting on boats: it would be a tremendous risk for the Bear Islanders to try to capture the longships at sea. Thus I must conclude that it was the Bear Islanders who set fire to the Greyjoy ships, and they targeted the seagoing longships, leaving the two beached ships ripe for capture. Just how useful can two Greyjoy longships be? Incredibly useful. Recall that there is no significant ironborn threat on the northwestern side of Westeros. Victarion led the Iron Fleet on a quest to Essos. Many of the remaining fleets (owned by various lords of the Iron Islands) are committed to battle in the Reach, particularly up and down the Mander river. What ships remain in the Iron Islands are almost certainly used for purely defensive and supply-chain functions. The Ryswells and the Dustins had surprised the ironmen on the Fever River and put their longships to the torch. This means that the ironborn in the north have largely been abandoned, which for all appearances seems to be completely true. With the ironborn fleets committed elsewhere, it would seem that the Bear Islanders have safe passage anywhere along the northwestern coasts. Quite literally these two Greyjoy longships have complete run of everything between Bear Island and the Iron Islands. If you should have present in your army someone who keeps the enemy advised of your designs, you cannot do better if you want to avail yourself of his evil intentions, than to communicate to him those things you do not want to do, and keep silent those things you want to do, and tell him you are apprehensive of the things of which you are not apprehensive, and conceal those things of which you are apprehensive: which will cause the enemy to undertake some enterprise, in the belief that he knows your designs, in which you can deceive him and defeat him. If my earlier theories are correct and Stannis does suspect Karstark of betrayal, then the difference in intelligence is a deliberate attempt to deceive the Boltons. What could Stannis possibly do with two ironborn longships? I’ve already asserted the idea that Stannis fakes his own death so that he can lure Bolton allies from Winterfell. With Stannis presumed dead, his enemies will be more likely to focus on other issues. Stannis can maximize the benefit of this “distractibility” if he can create and control the other threats that draw Bolton’s attention. This is particularly true if these feints can be disguised so that Stannis’s involvement is not revealed. How can the unaccounted-for Bear Island fighters serve in this regard? They can strike at a weak spot in the Bolton campaign, such that Bolton’s allies must leave Winterfell. Recall that I showed that the entire west coast of Westeros is quite vulnerable. This means that the captured longships could readily sail into Saltspear and up any of the rivers. This would allow the longships to approach Barrowton, the seat of House Dustin and presumably one of Roose’s most loyal allies. Why would this be of consequence? What is the benefit of sending the longships to Barrowton? The longships and the Bear Islanders would set fire to Barrowton. This attack would compel Barbrey Dustin, the Ryswells, Stout and possibly the Flints to race from Winterfell. Has setting fire to Barrowton been suggested? Thus readers have been given the idea of the town’s susceptibility to flames. It is interesting to note, but it does not ensure that Stannis would know this information. So then, does Stannis know that Barrowton might be susceptible to such an attack? So clearly, Stannis knows just how ‘wooden’ Barrowton is. This is not even counting the chances that another lord might be able to tell him of the town’s nature. Wouldn’t Roose and the others realize this is a Stannis ploy? First off, Stannis is presumed dead. Second, the attack would be conducted while disguised as Greyjoys. After all, the longships were Greyjoy in origin, belonging to the Iron Fleet and likely have Greyjoy masts, prows and so forth. So what does Stannis gain from this guerrilla attack? Not only does this attack reduce the manpower in Winterfell, it removes many of Bolton’s most loyal allies from his armies. It increases the ratio of Stark to Bolton loyalists: indeed would any Bolton allies remain at all? Has Stannis shown any concern for the numerical strength that remains at Winterfell? The answer to this would demonstrate his interest in whittling away at number, that he has ploys in mind to further reduce that strength. What escapes most readers here is that Stannis is not concerned with the number attacking him… he wants to know how many are left at Winterfell. The notion that he is after that information instead strongly suggests there are moves he’s already got in motion. With the statement “he has sent some portion of his strength” Stannis shows that he sees the benefit in whittling away at Bolton’s numerical superiority. The point here is that Stannis in actuality cares very little about the approaching Freys and much more about how his strategy is chipping away at the Boltons. It’s obvious that this tactic would remove a hefty number of men from Winterfell. However, Roose Bolton himself commands the largest number of men in Winterfell: the castle remains incapable of being taken. Stannis needs something more, some event that could compel Roose Bolton to depart Winterfell with the majority of his strength. This is where I refer back to the plot I described in The Dark Fortress, taking the Dreadfort as a means to capturing Winterfell. This entry was posted in The Mannifesto on October 10, 2014 by cantuse. Your dedication to the organic process of discovery and realization by story-telling is the main reason I will keep reading these great essays. It simply feels like it’s a real detective tale told within the books. It’s a great change of pace from the flashy and compromising “tl;dr” statements that make up most of what I’ve seen on the ASOIAF reddit. Thanks a lot for the encouragement. I’ve tried a number of approaches to my posts… and when I read the rough drafts I keep finding that the more rhetorical/inclusive approach is more enjoyable. I think that the ‘organic’ process helps makes the process feel more involved. It’s also a reason why I stopped writing theories on r/asoiaf: the limitations of the medium (and the way it is used) discourage long-form analysis. Uhh…. Just, wow. I’ve had such a difficult time finding readable, cohesive essays about possible future plots and their accompanying minutiae. Thank you so much for what you have been doing. It feels like an entire new world has been opened to me. Your writing is compellingly superb; keep it up! Thanks. I’m going to be out of commission for a month (surgery next week), but I’m constantly perusing for entertaining theories. One of the reasons I’ve been so quiet of late is because I feel that the Mannifesto (aside from notable revisions) is largely complete. I don’t want to be so desperate for attention that I start writing for attention’s sake alone. I’ll wait until I have more insights first. I respect that. It seems like a lot of people are veering off into “everyone is a Faceless Man or a Targaryen” territory, so it’s quite refreshing to read material that is focused in scope and built upon textual and historical connections. I’ve read so many of your essays in the last two days, so I can’t remember exactly which it was, but the stuff about Napoleon and other military commanders from history is beautiful. In any case, I wish you a speedy recovery! Seriously, thanks again for what you have been doing.